Members of the Victorian British Royal Family, were animal lovers and fanciers across a wide number of disciplines, including poultry, dogs, game, cattle, birds and of course, cats. Although the Queen did certainly own Persian cats, in most cases these were generally gifts from her subjects. 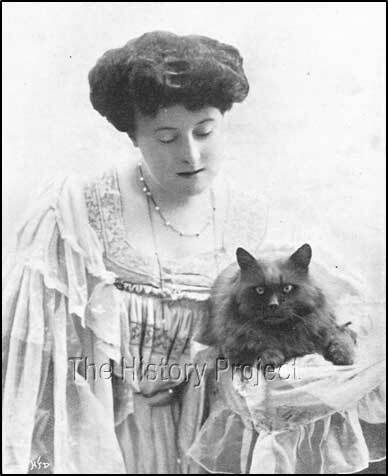 The true cat fanciers amongst the immediate family members, included her grand-daughter via Prince Christian of Denmark, the Princess Victoria of Schleswig Holstein; and the Queen's daughter-in-law, Princess Alexandra, who although an avid dog fancier, did take an active interest in cats and their welfare. 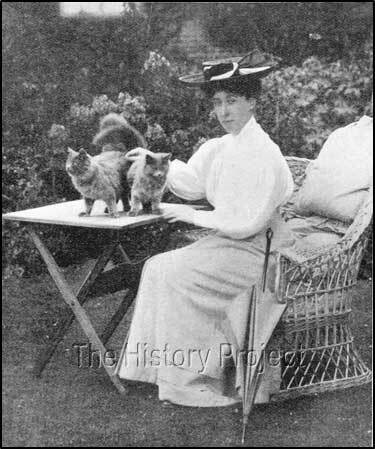 The young Princess Victoria in particular was a Patron of the Chinchilla Cat Society and an active breeder and exhibitor of Blue Persians, Silver Tabbies and her beloved Chinchillas. 'Royal Bobs' is just one of a number of Blue Persians that she bred and then sold for breeding and showing. 'Royal Bobs' date of birth is given as 5th October, 1900. He was bred by HRH Princess Victoria of Schleswig-Holstein, being sired by Lady Marcus Beresford's blue male 'BLUE BOY II' (1897) and out of the Princess's blue queen 'DUSCHAR' (c1898). Other than his aforementioned litter sister 'JILL' in the paragraph above, the only other traceable full sibling, is a litter brother named 'AMESH' (aka 'Bagdad Amesh'), who was sold and exported to the United States, to Mrs, J. V. Gotwalts of Pottstown, Pennsylvania. 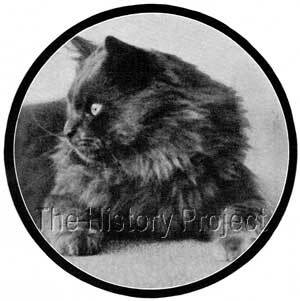 In Our Cats and All About Them (1902), Frances Simpson describes 'Royal Bobs' as a dark slate blue, 'but very sound in colour, with a beautifully shaped head and fine eyes...." And it is from the same source that we are given some of his show records: "In 1901, he took 1st in the Cat and 1st in the Kitten Class. Since then he has taken four other 1st prizes and two championships, besides many specials." Few progeny are recorded and one or two that are suspect in registration, such as a Blue female named 'Costly Lady', sired by 'Royal Bobs' and out of a Cream or Red female named 'Iolanthe'. If 'Costly Lady' was in fact his daughter out of 'Iolanthe' then genetically, she would have had to have been a blue-cream and not a blue. But a valid registration is that of a blue female he sired named 'Varla', out of a queen named 'Fortuna'. This daughter, 'Varla', was later to be bred to 'Ch. Neila Billa of Thorpe' to produce 'Vanity of Thorpe' for Mrs. Slingsby. Our Cats and All About Them by Frances Simpson, 1902. Cats for Pleasure and Profit by Frances Simpson, 1909. The U.S.Register and Studbook for Cats, 1906.